If high quality, on time delivery, competitive pricing, and a commitment to year after year productivity improvements are important to you . . . get to know TruForm. 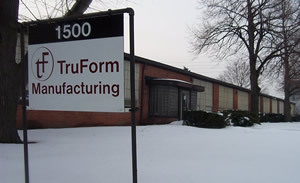 TruForm's mission is to offer our customers a cost effective single source manufacturer that provides a total range of capabilities within the precision sheet metal, machining, and mechanical assembly industry; from the design phase through production manufacturing. We're with you from start to finish, helping you achieve your goals. At TruForm, our aim is to improve your bottom line. Our work is precise, and ready on time eliminating costly delays. TruForm's mission is to offer our customers a cost effective single source manufacturer that provides a total range of capabilities within the precision sheet metal industry; from the design phase through production manufacturing. My bottom line has improved since I began using TruForm molding. The work is precise and ready on time, eliminating costly delays. Headquarters expands by over 2,000 sq. ft. as painting and molding capacities increase. New "facelift" unveiled for www.truformmfg.net showcasing customer-friendly features and a crisp modern look. An expert staff well-versed in all phases of sheet metal: welding, moulding, painting, and assembling.